Learn how to use the library search tool, Discovery. Click the Search Options link under the search box. Will return results where all your search terms were found. Find any of my search terms. Will return results where any of your search terms were found. Click the blue icon next to 'Search Modes' for more information. Finds items only available in full-text online. Finds items from the library catalogue. 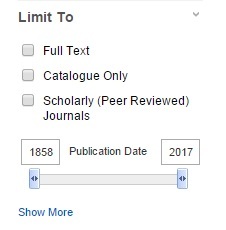 This limits results to only those items which are published in peer reviewed sources. This limits results to items published within a specific date range. This allows you to enter your search terms in the three search box, one concept per row. Type in the OR operator to search for similar terms. Use the menu to the left of a search box to link the boxes using Boolean operators AND, OR and NOT. Choose the Boolean/Phrase search mode or use the Advanced Search to use Boolean Operators.